A Green Bubbly Toast to YOU! | WineStraws | Drink Red. Smile White. A toast at your Saint Patrick’s Day celebration doesn’t need to be traditional. 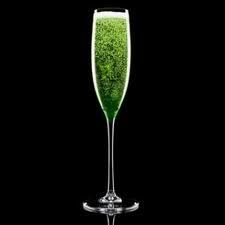 So put down that green beer and let us help you start your own tradition with WineStraws original Green Bubbly Toast. With green Midori and flecks from a pot-o-gold this drink will be sure to bring you the luck of the Irish. Serve chilled and toast to a year filled with happiness and joys that grow like shamrocks all year round!